In ASIA - Everyday is Wishbone Day! 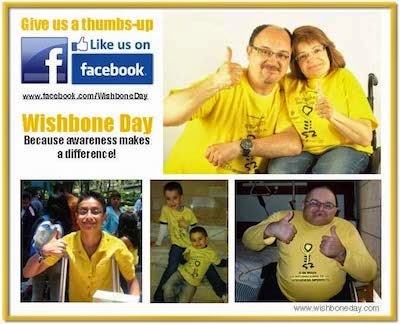 It’s been five months past Wishbone Day but its essence still lingers and the realities of developing and poor resource countries are still etched on my mind. 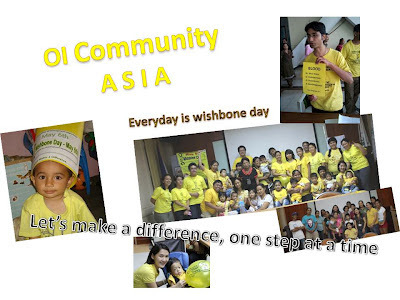 Asia is a very diverse region, and with the technology of social networking, OI families in our region are now connected , thanks to Wishbone Day and facebook. It is where the families share their experiences (good or bad), ask questions (simple or not so simple), and gives encouragement and support to those who are feeling alone and in doubt. It is a challenge for us to raise OI awareness in our region, to reach out to other OI families and bring the positivity, that sometimes, is the only thing that keeps some families going (yes it’s true!). Raising OI awareness is not just a one-time thing. It doesn’t end after Wishbone day. It is a continuous process, a lifetime commitment for most of us. But still, the root of our problem is the lack of it. That’s why we have to make everyday feel like Wishbone day. Every opportunity to involve others and raise awareness counts. Be it in our children’s school, hospital, friends and classmates. Every person oriented, can be another source of information for others. And so the chain of information starts with us and ends up at infinity. Through this we can make a difference one step at a time.